Not that we would expect any less, but the designer looked effortlessly stylish in a denim minidress from her own line, (I want!) and flatform brogues. I love that she hasn’t gone with an overly obvious ‘festival fashion’ look and manages to keep it chic. I mostly love these sunnies, but the rest of the look is still super cool. Head to toe in black, Poppy styled casual converse with a mid length skirt and slogan hoodie layered under a leather biker. This outfit has festival written all-over it and Millie looks cute as ever in her floral print dress and obligatory Hunters. Not exactly ground-breaking but I think she still looks gorgeous. Maybe its because she is bod goals, but Dua Lipa’s on-stage outfit has had me wondering if I should have a go at pulling off tracksuit bottoms (answer is no). She was giving some serious Sporty Spice vibes in a pink fishnet crop top, and emerald green tracksuit bottoms, and I loved it. Not many would pull off this look but Adwoa is so effortlessly cool I can imagine she could wear pretty much anything and sill make best dressed lists. She’s ticking trend boxes with a beret and yellow tinted glasses, and that camo print will do well to disguise the mud. Practical gal, I like it. 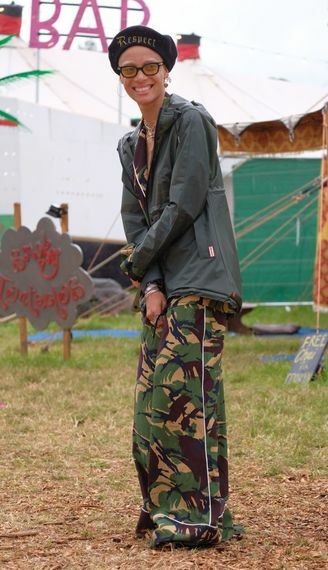 While these stylish celebs are giving us major inspiration for our own festival looks, we’d love to know whose Glastonbury get-up you were loving – tweet us @Avant_PR!